There are only 2 days left to sign up for Battle of the Bands. We are still looking for acts to play in between the competing bands. The meeting for all those performing will be announced next week. Our Cross Country Rams came home again yesterday champs: boys and combined! We swept 4 of the 6 divisions, and have qualified the entire team for Metros next week. This is 14 in a row! Congrats to all runners and good luck next week! Victoria College at U of T is offering the Vari Scholarship for students who intend to go on to a careed as a teacher. If you plan to apply to Arts & Sciences at Victoria College, go to Student Services to pick up an application. If you are interested in being on the Formal Exec for 2006-2007, please see Jacquie Grant or Laura Hermiston for an application. Applications are due to Jacquie or Laura on Friday, October 20. This week is green and gold week. Buy out tickets are on sale at lunch today outside the gym office for $3 per game or two for $5. Thursday at lunch is the pep rally. Thursday at 2:30 is football. Friday at 2:30 is girls' senior basketball. Come out and support the Rams, ECI! University Info Night will take place on Wednesday, November 15. Details to follow. Next School Council Meeting: Wednesday, November 1. The minutes from the 2005-2006 school (parent) council are now online. View as Flash (72.9KB) or as PDF (103.0KB). View as Flash (73.4KB) or as PDF (102.0KB). 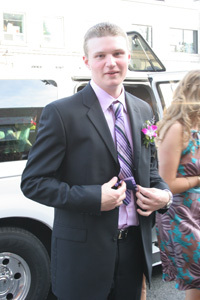 The pictures from the 2006 athletic banquet are now online. Congratulations to all who applied for next years Athletic Exec. It was a very tough decision and if you didn't make this year's exec, please don't hesitate to apply at the end of next year. Thank you for all those who applied for the Prefects Committee 2006-2007. The list of all those who made it is posted on the Prefects board. Those on the list please write down your e-mails for us to contact you. Congratulations to the next year's Prefects! We'll have a great year. For all those who couldn't apply this year, don't worry, you can apply next year. Mr. Steponas and Dr. Smale have planned an excellent adventure for March Break 2007. Italy and Greece promises to be fantastic. Milan, Venice, Rome, Pempeii, and swimming off the island of Crete in Greece. You know you want to go. Submit your deposit now to guarantee your seat for a trip of a lifetime. Seats are limited. See Mr. Steponas. Congratulations to the girls softball team for a great season. They went to the city championships to play the East end teams. After a tough 7-3 loss to Woburn CI, the Rams faced the MCI Bears again. We showed them again who was the superior team as we solidly beat the team 12-1! We finished up 3rd in the city. Wait for us next year Toronto, you ain't seen nothing yet! David Solomon-Easton and Emily Paskevics has each won their $80 formal ticket. The Etobicoke Rams came out charging the Martingrove Bears at the West Region championships for girls softball. The Bears were knocked off their paws as the lady Rams quickly took the lead, scoring 8 runs in the first few innings. However the Bears wrestled back as they scored several runs. It was a tight battle and nerves were tight as we came up to the bottom of the 7th. ECI had the Bears in a "Do or Die" hold and the girls were able to hold them off, winning the West Region Championships with a final score of 10-9. This ends a many year drought! The pictures for the 2006 Arts Alive, FAT, and Etobicoke Idol events are now online. Hot off the heels of a very successful France and Belgium extravaganza, the Smale and Steponas caravan is ready to roll yet again. We are planning a trip to Italy and Greece for March 2007. If you are interested in learning more about this fabulous excursion, then come to an information meeting today at 11:40 a.m. in room 368.